Coming into the season, we were looking forward to providing some high-quality analysis of the Chicago Cubs and Chicago White Sox, but as it so often does, life gets in the way. I’ll let David explain the real world stuff that’s been going on in his life lately (hint: it’s awesome news), but as for me, it’s simple: my paying journalism gigs have been ratcheting up in recent weeks. The Chicago Blackhawks are in the Western Conference Final for the second consecutive year. I’m covering the Anaheim Ducks and Los Angeles Kings for NBC Los Angeles for the second straight season. I also had to cover the Chicago Bears and the run-up to the NFL Draft. Finally, there’s my job where I cover high school sports for a local newspaper. All of those gigs can take a huge toll on my enthusiasm and my time, but for now, I’m going to try to bounce back more and write up as much about the Cubs as I can. It won’t be an everyday kind of thing, and there may be other times during the year where I miss some time in writing, but I’ll do my best to get back in the swing of things and actually keep this page somewhat updated. For now, I hope you’ll settle for a few assorted thoughts that I have about the Cubs through their first 38 games of the season (and I’ll expound more on these thoughts when I release my First Quarter Report Card this weekend). -Before the season started, I said that I didn’t think that Jeff Samardzija was worth the ace-money that he was going to be seeking, and so far, I’ve been proven completely wrong. In seven starts, Samardzija has a WAR of 2.3, a WHIP of 1.05, and an ERA of 1.45. Despite that success, he has an 0-3 record so far this season, and I wouldn’t blame him if he wanted to punch out a couple of Gatorade coolers in a fit of Zambrano-esque rage. Granted, a great stretch of starts doesn’t necessarily mean that I’m wrong about how much money to pay him, but I still remain convinced that his best chance at success remains elsewhere. The Cubs are doing a good job of getting the most out of him now, and they are making progress in terms of their rebuilding project, but they won’t be good enough soon enough to warrant Samardzija sticking around. His value is shooting ever higher, and the return the team could get in a trade for him could be the final piece to the puzzle for the club. -Speaking of pitchers I made predictions about before the season, Jason Hammel has been proving me right when I called him this year’s version of Scott Feldman or Paul Maholm. In seven starts, he has a 4-1 record, a WAR of 1.7, and a WHIP of 0.86. He is still mixing his pitches as well as he was during spring training, and if he can keep doing that, then the team should get an even better return than they did in the Feldman deal, when they got Jake Arrieta and Pedro Strop. -Last season, both Starlin Castro and Anthony Rizzo struggled in a big way, leading some to question whether or not the two hotshot youngsters were going to flame out before the Cubs’ rebuild could be completed. They’re definitely answering those questions well, with Castro batting .279 with five home runs and 19 RBI in 154 at-bats. Rizzo has slugged seven home runs and driven in 21 runs, and he’s already got 27 walks, which puts his OBP at nearly .400 (and his OPS at a very impressive .860). The teammates are only a quarter of the way through the season, but their adjustments at the plate have already produced some serious results. Castro is making much better contact than he was for most of last season, and Rizzo seems to have a more consistent approach too. If they can keep that up, then Rick Renteria has to be given a good deal of credit for resurrecting them. Cubs Over/Unders: How Will the North Siders Fare? It may come as a bit of a surprise since the weather outside has been so abysmal lately, but Opening Day is indeed upon us, as the Chicago Cubs will kick off their season on Monday afternoon against the Pittsburgh Pirates at PNC Park. The Cubs will be looking to build upon a 2013 season that can only be viewed as a disappointment, even by the measure of where they are in their current rebuilding phase. Several players took big steps back, and the firing of Dale Sveum and the hiring of Rick Renteria to manage the club are an indicator that the front office feels the same way. Could Rizzo’s Hot Bat Be a Sign of Good Things to Come? Last season, there weren’t very many bright spots in the Chicago Cubs’ batting order, and even though he cooled off considerably after a red-hot start, Anthony Rizzo was still just about the only bright spot for the team. Even with a .233 batting average, Rizzo still paced the offense with 23 home runs and 80 RBI on the campaign, and he also racked up 76 walks to boost his OBP to .323. When you add in the 40 doubles and 71 runs he pitched in, it’s not a stretch to say that he was the straw that stirred the drink for the North Siders in 2013. This spring, Rizzo has shown some signs that he could be rounding back into the form that allowed him to get off to such a hot start last year. He has two home runs and nine RBI in 38 spring at-bats, and he is hitting a healthy .368 for the Cubs. His OPS of 1.073 is obviously inflated by the limited number of at-bats he’s had, but it’s still a great sign for a guy who is going to need to bounce back if the Cubs are going to improve offensively. That quality play continued on Saturday as Rizzo and the Cubs fell to the Cincinnati Reds at Cubs Park. Rizzo had a great day despite the outcome, racking up three hits and two RBI in the game as the Cubs fell 8-3 to Cincy. He slugged an RBI double, his third of the spring, and also added an RBI single in the sixth inning to cap off a nice day at the dish. Whether or not you believe in the concept of “lineup protection,” you have to wonder whether or not Rizzo will be able to improve much upon his numbers from last season unless he has someone else batting behind him to take some of the pressure off. Pitchers aren’t going to challenge Rizzo much without a guy like Mike Olt stepping up behind him, because there’s no incentive to keep him off of base if a guy like Nate Schierholtz is batting .250 in that spot. That negativity aside, it’s good news for the Cubs to see Rizzo hitting that well during spring training. He had a rough go of it last season once the calendar moved into the summer months, so he’s no doubt been preparing like crazy for this season. Hitting 4th in an order that isn’t exactly chock full of talent can’t be much fun, but it appears that Rizzo is eager to rise to the challenge anyway, and if he’s lucky enough, he’ll be able to drive in players like Starlin Castro more often this season. 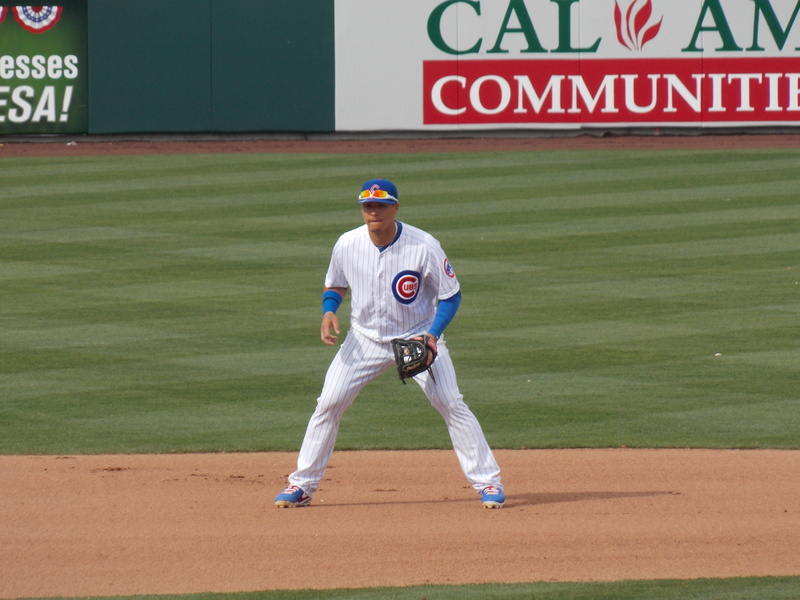 Mesa – The Chicago Cubs have made it clear all spring long that they would be sending shortstop Javier Baez to the minor leagues for the beginning of the regular season, and the team was true to its word as it assigned the 21-year old to minor league camp on Saturday. In a wide-ranging interview with Cubs.com, Baez expressed all of the right sentiments about his demotion, and said that he is looking forward to continuing to work on his game as the organization gives him pointers on how to do so. 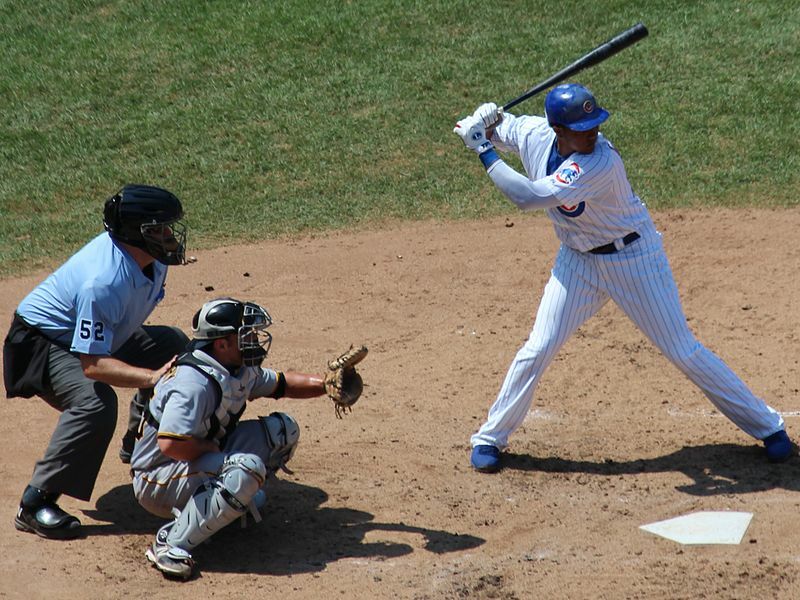 As spring training has worn on, and as shortstop Starlin Castro has continued to sit out games with a hamstring injury, more and more fans have been asking about whether or not Javier Baez could potentially make the Chicago Cubs’ opening day roster. His four home runs in Cactus League play (including one in Surprise on Tuesday night) have done little to pour water on those rumors, but Cubs GM Jed Hoyer did just that on Wednesday morning. Baez has been bouncing around the field a bit for the Cubs in spring training, with manager Rick Renteria looking to work him out at several positions. He has played some games at shortstop, but this week he has also been getting some time at second base. Hoyer added in the interview that Baez will start at shortstop for the Iowa Cubs, but that he could still see a bit of action at second base once their season starts in April. As for the Cubs’ current situation at the position, there’s no telling if Castro will actually be ready when the season begins at the end of the month. He still hasn’t gotten into a game since pulling his hamstring, and he said that he would likely need 8-10 games in order to get fully prepared for the regular season. The Cubs only have 11 games left (12 if you count split squad action), so Castro is getting close to a point where he may not be able to get his preferred warm-up time before the grueling 162-slate begins. Even with that in mind however, the Cubs are still making the right choice when it comes to sending Baez to the minors. He is arguably the top prospect in their farm system, but with the team not really poised to do much of anything this season, it doesn’t make sense to burn a year of arbitration eligibility just to have a starting shortstop for a week or two while Castro gets ready for the season. Starting Darwin Barney or Donnie Murphy in that spot makes a lot more sense as a short-term solution rather than starting the clock on Baez’s MLB service time, and Hoyer is right to exercise patience with one of his prized assets. Chicago Cubs manager Rick Renteria has made a lot of headlines during his tenure with the club, mostly discussing his positive attitude and the way he’s going to handle the team’s younger players, but he has rarely made direct comments about what he’ll decide to do with the lineup once the season begins in April. The thought of putting the free-swinging Castro in the lead-off spot may strike some fans as strange, but it isn’t the craziest idea in the world. After all, Castro does have experience there, with 181 plate appearances in the lead-off position last year. He hit for a .263 average to go along with a .315 on-base percentage. Neither of those numbers were particularly great, but they aren’t awful either, especially on a team that doesn’t have a player tailor-made for the position. Junior Lake would be another guy to potentially plug in there, but outside of him, the well dries up quickly. The problem with Lake is that his experience was very limited, with only 39 plate appearances in that slot during the 2013 campaign. He did rack up 15 hits and six RBI hitting lead-off, with a .405 average and .436 on-base percentage, but those numbers are slightly deceiving because of the limited number of chances that he got there. Renteria would definitely be well-served to try both players out in the lead-off position during spring training, but it’s interesting that he’s so willing to give Castro a crack at the spot. Castro’s ability to hit to the opposite field and unwillingness to take walks would seem to work better for him in the second or fifth slot in the lineup, but Renteria could be influenced by the mediocre .235 average Castro carried with runners in scoring position last year. At any rate, as a new manager Renteria seems to be eager to use the clean slate that he’s been given in terms of tinkering with line-ups and making decisions, and putting Castro in the lead-off slot would definitely qualify. When the Chicago Cubs struck out on prying Joe Girardi away from the New York Yankees last year, there was plenty of discussion not only about who Theo Epstein and Jed Hoyer would hire to manage the team, but also whether or not they had even made the right decision in firing Dale Sveum in the first place. After all, firing a guy after only two years doesn’t exactly seem fair when you consider the “quality” of rosters that he had been given. In all likelihood, the 2012 and 2013 Cubs could not have won a championship in AAA, much less in the major leagues. Their win totals for the two seasons reflect that, with only a modest gain in that area in 2013 after a 61-win 2012 campaign. Amid all of that belly-aching and strife, the Cubs went out and hired Rick Renteria, bench coach for the San Diego Padres. During his introductory press conferences, Renteria said all the right things about wanting to manage this team, and how he felt so positive about the futures of guys like Starlin Castro and Anthony Rizzo, but it’s been his conduct after those press conferences that has been more impressive to Cubs observers.